Gallaugher’s textbook breaks down the learning barriers for app creation with a hands-on, video-centered approach. Learn to Program is intended to excite new-to-programming students in non-technical programs of study and will have them building fully functional apps by mid-semester. 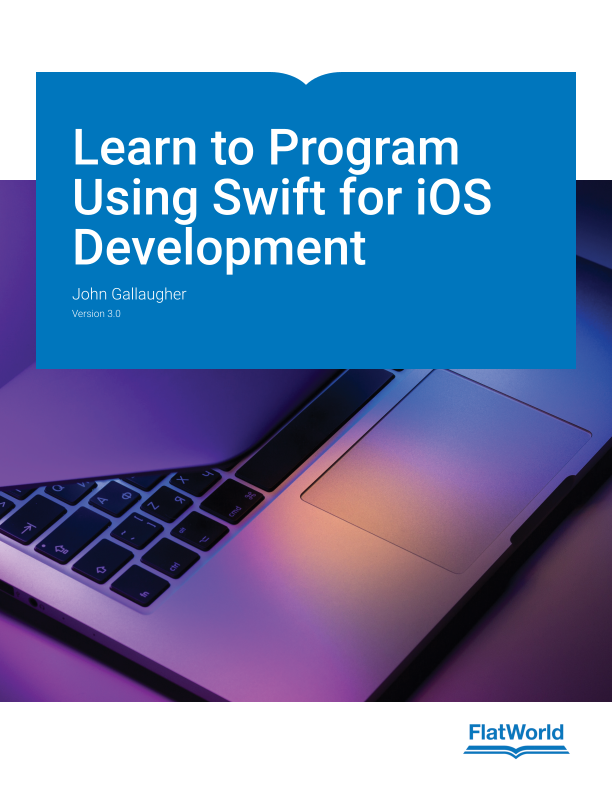 Students will gain an introduction to core programming and iOS concepts. Version 3.0 has been updated for Swift 4.2, Xcode 10, and iPhone X-series form factor. New and improved apps that provide learning examples that bring students from zero-programming background through Swift programming fundamentals and core iOS development techniques. These include the SWAPI app, showing how to load paged JSON data while scrolling, and the Snacktacular app, which is a full-blown social app similar to Yelp and TripAdvisor, supporting Muti-user shared login via Google ID/Password, data that is saved and pushed out to all users in real-time using Google’s Cloud Firestore service, location plotting on a Map, image saving and sharing, and more. In a single class your students can go from zero to full-stack developers! Even more Reference content, including animated .gifs, improved graphics, and links to code that can be copied and pasted from GitHub’s .gist. A section introducing Git and GitHub, as integrated into Xcode for source control. Updated and expanded lecture videos that account for changes in Swift 4.2 (especially in generating random numbers), Xcode 10, and a continuation of the earlier version’s work in prepping apps for the form factor introduced beginning with iPhone X. Additional exercises, roughly half of which have video solutions to power even greater student learning and to help faculty provide a better learning environment. An updated and improved set of instructor slides, useful for faculty regardless of format: flipped classroom, blended, or traditional lecture. Expanded and refined student quizzes at the end of each chapter, plus mid-term tests and final exams, along with answer keys and suggested grading rubrics. Continued access to “beta” content that includes updates, corrections, additional videos, and even more learning resources, posted while they are being developed. Encourages self-directed learning for a variety of classroom types. Continuous high-value annual updates, including adding new exercises and additional content to keep this book up-to-date, fresh and exciting.